The people of Altona had made several attempts to seceded from the Werribee Shire given that the felt that whilst the covered a small portion of the Shire in area, they held more than 50% of the residents and therefore contributed a large portion of the funds to the Shire’s coffers but seemed to receive little in return. The latest such unsuccessful attempts was in 1952 and on this topic, ex-CR Grant was opposed to the idea. However, the people of Altona Riding did not give up and in 1957 they were rewarded when Altona successfully severed from the Shire Werribee and was proclaimed a Shire, in its own right, on 27/2/1957. The Altona Shire, the 204th Municipality of the State of Victoria, was created on February 27, 1957. This formally proclaimed the severance of the Altona Riding from the Shire of Werribee. A poll for the election of nine Councillors took place on May 11, 1957 which was contested by 26 candidates. The nine successful candidates were sworn in at the first meeting of the Council held at the Municipal Offices in Queen Street on June 5, 1957. The first Councillors were: Reginald Logan, George Henry Ransom, Henry (Harry) Charles Kim (all being previous Altona Riding Councillors), Alfred William Langshaw, Walter George Cresser, Ronald James Cooper, Alfred Herbert Ford, Frederick Rush and Catherine Margaret Mary McIntyre (the first female to be elected to represent the ratepayers of Altona). The first Shire President was Cr George Ransom. The original Municipal Offices occupied the Altona Homestead building and was known as the Altona Organisations Centre. Meetings were conducted at the Homestead until February 1962 when the Recreation Room of the Altona Elderly Citizens’ Club was used until September 1963, when Council meetings returned to the Homestead until the end of November 1963. The Council then moved into the new Civic Offices buildings at 115 Civic Parade, December 1963. 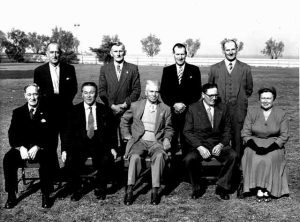 The boundary of the Shire was re-defined on April 24, 1958 when the 10 acre Laverton recreation reserve was severed and annexed to the Werribee Shire. The boundary was further re-defined on May 30, 1962 when 205 acres south and east of the Newport-Altona railway line was severed and annexed to the City of Williamstown. This final annexure left the area of the Altona Shire at 15.52 square miles (originally 15.855 square miles). The population of the Shire in 1957 was approximately 8,000 people occupying 2,300 residential units. Ten years later these had grown to 26,650 people occupying 6,670 residential units. The “Homestead” continued to be used as the Civic Offices until the new offices in Civic Parade were opened on 7th Demember, 1963. During the next few years annexations by the Shire of Werribee and Williamstown City reduced Altona’s area to 15.52 square miles. The following are a list of the persons who represented ratepayers as Councilors during the time that Altona was a Shire (1957 to 1968). Victorian Year Book, 1954 – 1958, p.426.